Virgil van Dijk has excelled for Liverpool this season. BAYERN MUNICH DEFENDER Mats Hummels has revealed that he thinks Virgil van Dijk is the best centre-back in the world. The Germany international held an “ask me anything” session with his Twitter followers, giving his opinions on a range of topics including a potential transfer to Liverpool, basketball and the movie Bohemian Rhapsody. Hummels jokingly responded to a question asking him when he would come to Anfield with the date 19 February, which is when Bayern Munich travel to Anfield to take on the Reds in the Champions League knockout stage. The World Cup winner regularly answers fan questions on his social media and provided an update on his viewing habits, informing his followers that he is now on season two of Friends and chose Chandler and Rachel as his favourite characters. He admitted he loved the film Bohemian Rhapsody, but despite a love of the NBA and the Dallas Mavericks, he could not “get into” American Football. Hummels was part of Germany’s World Cup squad again last summer, as the holders crashed out at the group stage. Despite that disappointment and the fact that Bayern won yet another Bundesliga title, his favourite footballing memory of 2018 came at the World Cup with his national side. Unfortunately 2018 was not that full with great moments, but Toni Kroos’ free kick against Sweden might stand out,” he admitted. Bayern Munich currently sit second in the Bundesliga table at the winter break, but will be hoping they can make up ground on leaders Borussia Dortmund when the German top flight restarts on 18 January. Bayern travel to Hoffenheim, where they can cut Dortmund’s lead to three points, with BVB not playing until Saturday, when they take on RB Leipzig in the evening game. Hummels will then come face-to-face with the man he believes to be the world’s best centre-back as the Bavarians play Liverpool at Anfield on 19 February, before the return leg in Munich on 13 March. Email “World Cup-winning defender believes Van Dijk is the best centre-back on the planet”. 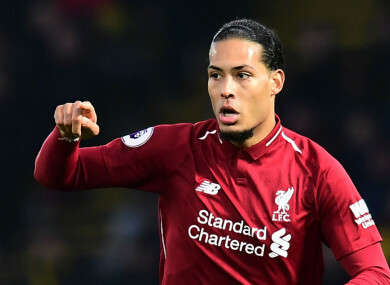 Feedback on “World Cup-winning defender believes Van Dijk is the best centre-back on the planet”.